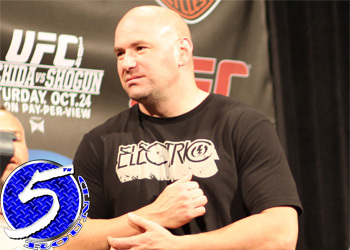 UFC president Dana White has officially dropped the gauntlet on welterweight studs Jon Fitch and Thiago Alves. The promoter announced during today’s UFC 117 pre-fight press conference that the victor of the long awaited rematch will fight for the belt in their next outing. The mulligan was supposed to take place at UFC 111, then again at UFC 115, however Alves was forced to bow out on both occasions due to an abrupt brain surgery and an extended recovery period. It was assumed all along the scrap was a top contender bout, however the recent addition of Jake Shields and emergence of Martin Kampmann had folks briefly questioning the pecking order. White made quick work of the matter by knocking out the announcement less than a few ticks into Thursday’s presser. “Yes, Jon Fitch will fight Josh Koscheck if he beats GSP,” White stated. In their initial meeting at “UFC Fight Night 5″ back in June 2006, Fitch managed to land a vicious up-kick to Alves’ grill in the 2ndRound that ultimately put him out. Fitch owns a 22-3 professional record and is considered by many as the world’s second best welterweight. Although his resume is impressive, the wrestler hasn’t posted the spectacular finishes that UFC brass and fans enjoy seeing. All of Fitch’s last six wins have come by way of decision. Alves holds an impressive 16-6 record, however hasn’t been seen inside an Octagon since being dominated by St-Pierre at UFC 100 last July. Fitch and Alves will throw down inside Oracle Arena in Oakland, California this Saturday at UFC 117.